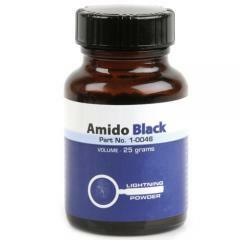 Amido Black is a protein dye sensitive to the properties in blood. It can be used to enhance or develop blood-contaminated latent prints. Bloody latent prints, even those not visible to the naked eye, may be developed on porous or nonporous surfaces, such as cadavers, wood, or paper. You can purchase Amido Black powder (25 gram bottle) and mix it in Glacial Acetic Acid and Methanol. Shelf-life of Amido Black Powder: indefinite unless wetted. The working solution becomes contaminated quickly upon use. It is best to mix fresh solution if contaminated.